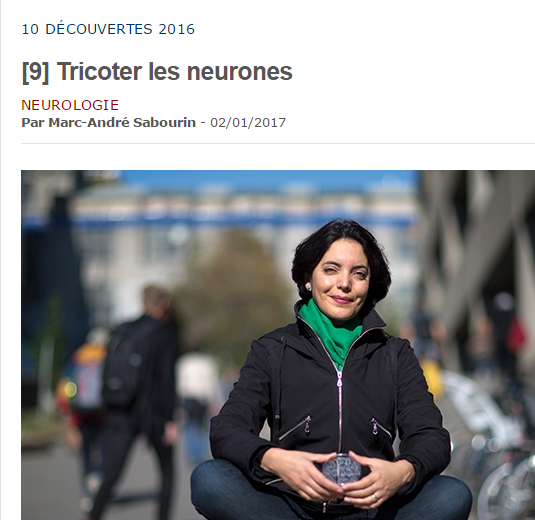 A discovery made in collaboration with researchers from our research center is amongst the top 10 discoveries of 2016, according to Québec Science magazine. Interested in nerve repair, but not satisfied with the pharmacological approach - long, costly and ineffective, neuroscientist Margaret Magdesian searched for tools to directly manipulate grey matter. "Nerve connections are of the nanometric scale, says Magdesian, so I looked into nanotechnologies." She turned to Peter Grutter, Physics professor at McGill University, and his atomic force microscope. Magdesian MH, G Lopez-Ayon M, Mori M, Boudreau D, Goulet-Hanssens A, Sanz R, Miyahara Y, Barrett CJ, Fournier AE, De Koninck Y et al.. 2016. Rapid Mechanically Controlled Rewiring of Neuronal Circuits.. J Neurosci. 36(3):979-87.